It was the first confirmation that Osama bin Laden was definitely in the compound in Abbottabad, Pakistan last Sunday. Shortly afterwards, a Navy Seal halfway across the world sent the message “Geronimo EKIA” – meaning enemy killed in action – which was relayed to a jubilant White House Situation Room. Why Geronimo? The code name was chosen for bin Laden because, like the Apache chief, he had managed to evade capture for years and was apparently able to vanish into thin air. As London’s Daily Telegraph reports, Geronimo’s ability to stay on the run gave rise to legends that he was able to walk without leaving any tracks, and that he could survive being shot. John Stewart, The Daily Show. 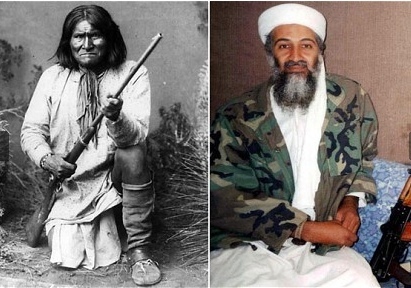 More than a century before bin Laden escaped from the caves of Tora Bora, Geronimo was said to have pulled off a similar evasion in New Mexico. He and his followers entered a cave which was said to have only one visible entrance, and then disappeared as US troops waited at the front. More than 5,000 soldiers were used to hunt Geronimo and a small band of followers. Unlike bin Laden he eventually surrendered in 1886. He went on to embrace Christianity and to become a celebrity, appearing at the World’s Fair in St Louis in 1904, and at the inaugural parade for President Theodore Roosevelt the following year. Abbottabad is named after General Sir James Abbott, a British army officer in colonial India who founded the town. The ‘abad’ ending comes from Urdu, originating from Persian to mean ‘abode, town or settlement’.